This last page will likely be as interesting to Hohner enthusiasts and researchers as the rest of the brochure. 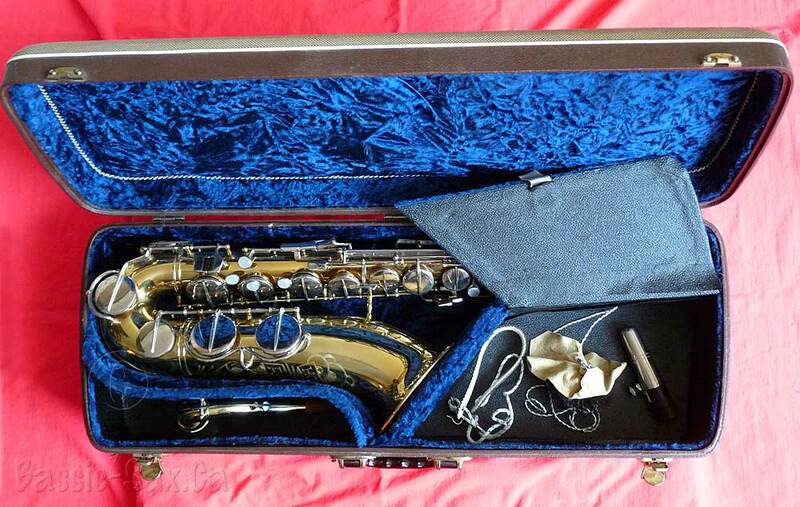 As I did on page 4, I will add photos from Hohner President saxophones which illustrate what these accessories look like in real life. These photos are included after the scanned imaged. A description of each accessory—where applicable—will precede each photo. If you take a look at the case that Hohner shows in this brochure, it looks nothing like the cases that came with the President saxophones. Or at least none that I have seen to date that came with their original cases. Although the case might look pretty, the lid to the closed accessory compartment is poorly constructed. Therefore even though it has seen minimal use, it is very loose. There is no proper hinge on the lid, so the inside has separated and the accessory compartment lid moves around too freely. The only thing keeping it together is the black material on the underside that you can see, glued to the blue, velvet-like material on the topside. I have to be very careful when I open it so as not to damage the lid’s “hinge”. The Pull-Through & What The Heck Is A “Sling With Felt Lined Neck-Band Smart Finish” Anyway? The chamois leather pull-through (39) and sling with felt lined neck-band smart finish (37), AKA neck strap, have the same pattern of white and black fibers woven into their cords. Interesting touch actually. Although not identical, the ligature that came with my circa ’61 tenor is of the same type Hohner described in its brochure (33). Note the movable tongue. When Hohner writes Reed Cover (34), I can only assume that they mean mouthpiece cap. This is what the original one from tenor 104XX looks like. 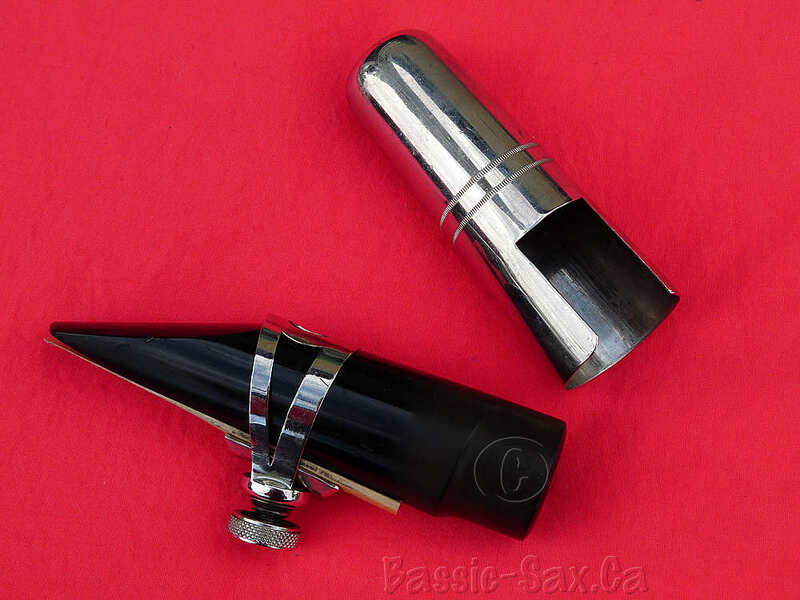 As you see in the photo above, as well as in the photo below, the mouthpiece (40) that came with my tenor does not resemble the mouthpiece that Hohner depicts in its brochure. It should be noted that all the Hohner Presidents that I have seen to date, that still have their original mouthpiece, all have mouthpieces like mine. 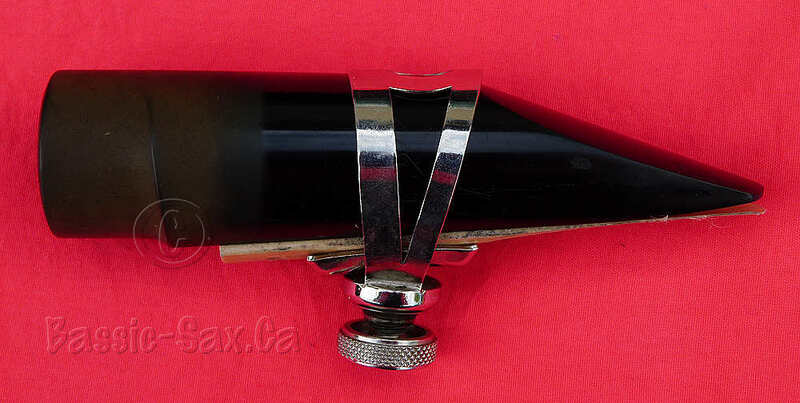 In all the Hohner images that I have amassed so far, I have only come across one that shows a mute. Alto 4858 had most (all?) 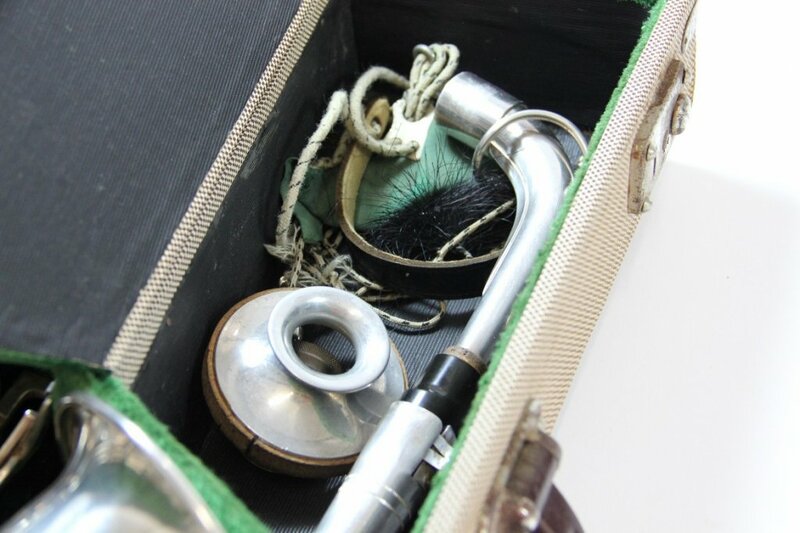 of its original accessories, including a mute (35). However, note that it appears to be cork, rather than felt lined. 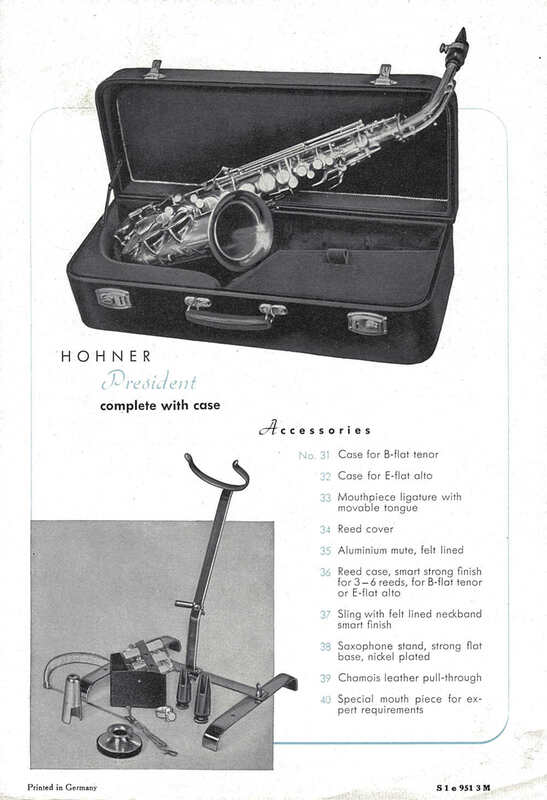 To date I have not seen either a reed case (36), nor a saxophone stand (38) like Hohner mentions in their brochure. 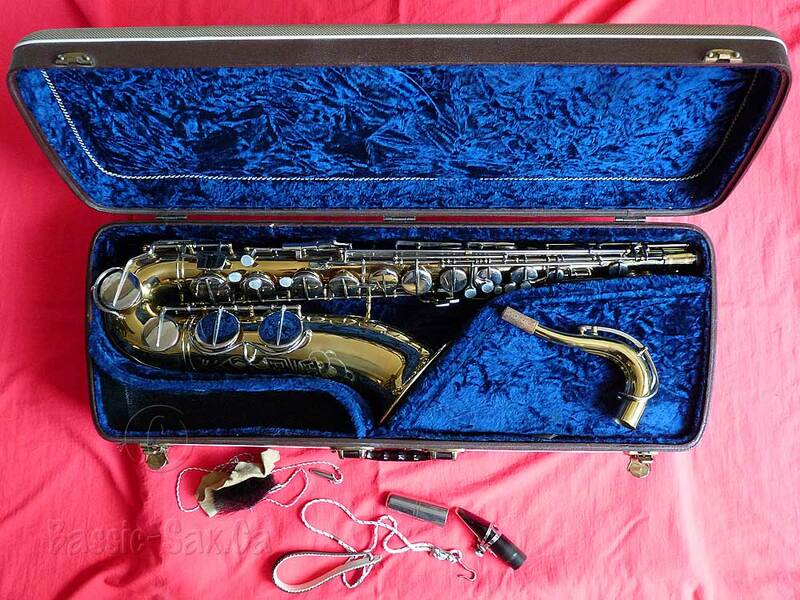 My tenor 104XX did come with a stand, but I am unclear whether or not it came from Hohner. I believe it to be a regular saxophone stand that was available for purchase here in North America. If research leads me to conclude otherwise, I will include photos of the stand on this page.